I heard about the History Channel’s broadcast of a Bible mini-series through predictable channels – the buzz through evangelical church culture that we should all watch this so that major media outlets would produce more like it. I’m not moved by such marketing ploys. I did feel some sense that I SHOULD watch the first installment so as to be able to responsibly review what I believed others would be watching. But I didn’t even do that. However, my friend Bill is a much more fair and honest critic of culture and of the contemporary religious scene than I. He has done us a favor and issued a generally favorable review of the first segment of this series. Bill has the background and grace to do this well. His wisest point was his reminder that we live in a biblically illiterate age, so that ANYTHING that in a reasonably accurate way tells the bible’s stories is going to be a helpful thing. Much more critical was a review published in the NY Times. Interesting to me was that this review did not, as we might expect, take shots at the series’ attempt to be biblically faithful. Rather, the reviewer felt that the series falls short of really capturing the grand flow and passion of the whole bible. The series gives snapshots of biblically reported events but fails to root them in an overall narrative. That seems like a fair critique, as Bill as well compares the series to the bible story books of our collective youth. By taking on the entire Bible, even at 10 hours in length, Mr. Burnett and Ms. Downey force themselves into a clumsy “Bible’s greatest hits” approach. This doesn’t serve the source material — so rich in interconnections across time — very well, and it doesn’t make for very involving television. Well, in my mind, perhaps not. Rather those looking for something that makes them feel the power of the bible arising from is marvelous interconnections across time would do better to find a good church and a faithful pastor/preacher whose goal it is to do just that. Starbucks, you’ve done it again. As much as I try to fault you when thinkgs are not quite up to my hopes, you have a way of reclaiming my affection. Today I was working in my Willasprings Starbucks corner office waiting for the line to shrink to a stage which would allow a quick trip to the bar. I was joking, Helen. We were supposed to laugh and go about our business. She wouldn’t leave it there. She turned to the clerk and said, “He’s with me” and then to me said, “What do you want?” I protested, but the clerk already knew that I order the same thing every time, and so she rang it up, and that was that. Small acts of kindness, to be sure. But it’s the small things that keep us coming back. To Starbucks, yes. But also to the church. UPDATE: Of course, just because you’ve been kind does not mean that we can’t still have some fun at your expense. Here is SNL’s take on your new Verismo machine. Classic. 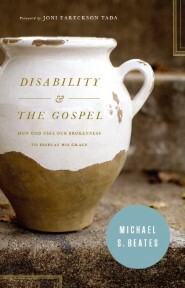 I just finished reading Mike Beates’ helpful book Disability and the Gospel: How God Uses Our Brokenness to Display His Grace . The book is important and necessary, and is disarming in its direct honesty. It is a disturbing challenge to consider how the Christian church has successfully excluded the ‘different’ and the ‘imperfect’ from her community. The book stimulated two tangential thoughts which I think call for some more long term thinking. Once again I’m struck with how God has used the non-Christian to shame the church. If any should be the champions of the weak and powerless, it should be Christians who have a deep appreciation for the gospel of grace. And yet the most forceful, effective and prophetic voices in fighting for accessibility in the broader culture have come not from Christians, but from those outside the church. Our blind spots have been legion (see slavery, civil rights, poverty). When will we have eyes to see the causes worth championing and the courage to champion them? One cause that we have championed has been a concern for the unborn. But labor in this field, while producing local and individual victories, has not produced much in the way of a fundamental shift in public concern. After 40 years, abortion is still legal and prevalent. And so I wonder if there is a connection between our embrace of the ’cause’ of life for the unborn and our lack of embrace of the actually disabled all around us. Causes are always easy to embrace, but broken people are not. Letter writing, petition signing and sign carrying are all fairly easy and antiseptic. But actually engaging our lives with those whose brokenness makes us uncomfortable is all so much more difficult. Perhaps what this exposes is hypocrisy in our camp. We OUGHT to care passionately about the unborn and the women who carry them. But the reality of our caring is tested and measured by our lack of concern for the born, but different. Perhaps God withholds his blessing until we learn to love in deed all the least of these. “A significant part of the health and strong culture of our community is built on the backs of hundreds of dedicated pastors, who week in and week out guide, nourish, counsel, comfort and challenge as many as 1,000,000 of our citizens. This is a tangible way for us to show that we are grateful,” said Patrick Morley, founder of Man in the Mirror ministries. Wow. I know this is meant well, but it is a bit over the top. I like what I do, and I think what pastors do is important, but I also think what garbage collectors do is important (and dangerous – see #4!). Should we not have a “Garbage Collectors 5K Run/Walk”? This run is timed with what has come to be known as ‘Pastor Appreciation Month’. Again, I know this is meant to encourage those engaged in pastoral ministry. I’m sure it arose from good people wanting to find a tangible way to thank those whose ministry has impacted them. But for me, a month in which people send cards or run races to show appreciation has just enough artificiality about it to make it just a bit distasteful. I thrive on being appreciated. I just read appreciation differently. Assuming there are other pastors out there like me, may I make a few modest suggestions regarding how to appreciate him? 1. Faithful attendance at public worship. 2. Saying ‘yes’ when asked to take on a responsibility that relieves a burden from him. 3. Assuming a responsibility when NOT asked to do so. 4. Holding realistic expectations of his ministry. That is, not expecting him to be Jesus, Paul, Piper, or Spurgeon. 5. Inviting others to attend your church. 6. Praying for him frequently, and letting him know you are doing so. I’m sure others can suggest other ways by which appreciation can be shown. Coming alongside of the pastor and supporting (with attendance and deeds) the ministry which means so much to his heart is the greatest encouragement. I don’t disparage cards, and gift cards (especially when they say ‘Starbucks’ on the outside!). But they mean more when they come in, say, February. And while we are at it, let’s buy a dozen donuts and a card and pass them on to your garbage collector to tell him thanks. At the outset of one of the best expositions of the Bible’s teaching on the centrality of the Kingdom of God (which all Christians are to ‘seek first‘), Richard Lovelace in his wonderfully helpful and concise Renewal as a Way of Life: A Guidebook for Spiritual Growth has a healthy reminder for us during a presidential season. A commenter to my post regarding my study leave said that she would pray that my study time would “lead to much future fruit for you and your flock.” I teasingly asked her to define such ‘fruit’ hoping thereby to know someday whether her prayer had been answered. It was only a tease in a marginal way. In reality, that is the question that any pastor or teacher or parent is constantly asking. How do I know whether what I am doing makes any difference? How do I measure the harvest of my investment of time and energy? It is very easy to opt for quantifiable measures. Decent Sunday attendance. Increasing FCAT scores. A trophy case full of a child’s accomplishments. But we all know that these metrics ring hollow over time. By what fruit do we measure success in ministry? My correspondent is right in saying that fruit is produced by God, and is sometimes invisible to the gardener. And yet, at least, if we cannot force it and we cannot even adequately measure it, what is the goal toward which we should point ministry? These questions support their own industry. Each year leads to a dozen new books on how one should ‘do’ church. One cannot keep up with all that is produced on the subject even if one was inclined to do so. There is really nothing new to be said. The most profound book on these matters is Richard Lovelace’s Dynamics of Spiritual Life published first in 1979. Six years or so later he published Renewal as a Way of Life which he bills as an expansion and a condensation of the first book. Little more than these need to be within reach when thinking about what ministry is to aim for. For my purposes here I simply want to note where Lovelace begins with his prescription for the church: Spiritual vitality arises in an environment in which God is being known and loved and in which those who know and love him are given over to Jesus as king. If we are finding ways in which we can move people in this direction, then we can take heart that we are doing well. The challenge of all this, of course, is heavy upon the pastor, or elder, or teacher, or parent. That is, we can move no people, no church, no classroom, no family in this direction if we ourselves are not seeking to know and love God and seeking his kingdom first above all other things. The question must become a challenge which must lead to repentance and a cry for grace. where dependence upon the providence and grace of God is commonplace and the source of uncommon joy. a community which therefore cannot help but reach out, exercise justice, and love mercy. That still seems adequate for the present, even if I might tweak the words here or there. It seems to aim at a community where God is known and loved, and his kingdom preeminent. So, if you pray anything, pray that this will be formed ever more deeply in my heart and then in the heart of those I lead. I mentioned on Facebook and Twitter (@rg7878) my gratitude to the leadership of the church I pastor for granting me a week of study leave. That lead to a conversation with my sister last night in which she assumed that I was taking a week off relaxing at home. Un, no. That’s not quite it. Pastoral ministry happens in the course of life – through God’s work in my own life and through my day by day interaction and involvement in the lives and struggles and questions of others. Depth in pastoral ministry comes from study and reflection and prayer. I read recently of John Piper challenging pastors to get away and study, and suggesting that most congregations do not really understand the amount of emotional and mental and creative energy it requires to prepare sermons week after week after week. John Stott in his “Reflections of an Octogenarian” challenges pastors to set aside one hour/day, one day/month, and one week/year to isolate oneself for study. Bill Gates used a similar strategy to keep himself sharp when the head of Microsoft. I like to joke with the seminary students who attend our church (Reformed Theological Seminary is two miles away) when they are complaining about writing a paper that they are pursuing a ‘career’ which will require writing a 4000-5000 word essay WEEKLY, due every Sunday at a particular hour, and there is no possibility for submitting it late. There is never enough time in a week to prepare a good sermon. Some of that preparation has to happen ahead of time. A week for study allows for some of that. “Study” for the pastor, however, is not merely a book discipline. A congregation has a right to expect that the person who challenges them regarding the things of God is himself actively pursuing and nurturing a vital relationship with Him. That can get lost in the busy moment by moment pressure of ministry. A study leave provides some extended time to address one’s walk with God. All of this is an argument for the idea of the pastoral sabbatical so eloquently plead by Eugene Peterson and others. But at the least it is an argument for pastors occasionally getting away from the routine to invest time in these valuable activities which are sometimes otherwise squeezed out or simply impossible. So, no, Jeanne, I’m not spending the week at home. Rather, I’m holed up in a conference room at the hospitable Canterbury Retreat and Conference Center in Oviedo, Florida. I can invest three, six, nine hours of uninterrupted time on a single project if need be (yesterday, it was long range sermon planning). I have stripped my calendar of appointments and meetings, and I have someone else preaching for me on Sunday. This allows me to invest time in other things. Still on the agenda are books to be read, worship services to be pondered, and even some software to learn to use better and more efficiently. And if I use the time correctly, there will be significant time spent talking to God and staring off into space thinking, reflecting, and dreaming. So, if you will, pray that God would bless this week and give me the uninterrupted time I need. By virtue of his position, a preacher rarely gets to go to other churches. My own peculiarity is that I like familiarity and, honestly, I like the church I pastor, Covenant Presbyterian in Oviedo. So, even when on vacation, I’m likely to be found as a congregant there rather than anywhere else. Today was the last Sunday of two restful vacation weeks and I uncharacteristically took the opportunity to visit a very popular local congregation. I attended their early service and so was still able to make it to my own church, albeit a few minutes late. To attend another church is a dangerous thing for a pastor. It can bring out all kinds of unsavory responses – envy and judgmentalism among them. I genuinely try to fight these and to give glory to God for the way in which he is using us all in building his kingdom in this community. And so I give thanks for this congregation. I really do. I know this church to be composed of men and women far more devoted to Christ than many. I know that God has given them a vision which is expansive and inclusive and worthy of praise. The problem is that I heard two sermons today – one preached at this church to 4000 congregants and one preached at our church to 110. And only one of them pointed to Christ. The first was a memorable and convicting message regarding the hardness of the human heart. The application directed us to dig deeply into the scriptures so that our hearts might be more receptive to the things of God. The second was a memorable and convicting message about the blindness of the human heart. The application directed us to abandon all self-religion and to flee to Jesus the author and finisher of our faith. The first, you see, identified a problem and then directed us how to fix it. The second identified a problem and and then directed us to the one who could fix it. The first directed us to effort we must expend to find hope. The second offered us hope to which we could already cling. The first challenged us to make something more of ourselves. The second reminded us that we can make nothing of ourselves apart from Jesus. The first was a message drawn from a story Jesus told, and that is as far as Jesus made it into the message. The second exposed the darkness of our hearts and pointed us to the Jesus who died for a heart as dark as mine that he might draw me out of that darkness. The first left me wanting to do more. The second left me grateful for the more that Jesus has already done. 4000 people heard the first message. 110 heard the second. I have faults that are legion. I have a heart that is corrupt and full of shame. I am so unworthy of the gospel of the grace of Jesus Christ, unworthy to be a recipient of it, and certainly unworthy to be a preacher of it. But I’m grateful for those God has used to show me how for so many years I was one who preached the first type of message. I know how easy it is to do. And when I do, I grieve. And my prayer will be for me, and for this other church, and others building Christ’s kingdom in this community, that God will no longer let us preach a message of human effort, but will solely lead us to exalt the gospel of the grace of his Son. Getting older does give one a sense of historical perspective. I’m old enough to remember when Christians were supposed to boycott Martin Scorsese’s The Last Temptation of Christ giving it well needed extra publicity but accomplishing little else. Then there was the angst among those planning denominational meetings when Holiday Inn began allowing the purchase of pornographic movies in units which were to be inhabited by their attendees. Boycott’s were called for, which was tough for the planners to heed. And I can remember a national assembly of my denomination, the Presbyterian Church in America, meeting in Florida the year the Southern Baptists approved a boycott of Disney. As the PCA debated whether to support that boycott, one beleaguered delegate pleaded that if the assembly were to approve the measure that its effective date be put off a week, as he’d brought his whole family to Florida with the promise of a Disney treat. I tend to ignore such things for several reasons. 1. If I chose products based upon the political activities of the company, I’d have a pretty narrow range of products available to me. I’m pretty sure Apple would go, as would Disney, and probably the NYTimes, a primary news source for me, down to the products I buy in the grocery. 2. And then I’d have to determine which political causes would be worth opposing. SBUX perhaps for its liberal social views; but then perhaps WalMart for what it does to small town economies. Where would I draw the line? Amazon sells some pretty lousy stuff, as does Books-a-Million. It’s kind of hard to make all one’s economic choices in this way. 3. A strategy is only so good as its prospects for success. If one wants to fight SBUX’s political views, pulling out in protest will gain little. Bearing a case up the chain as a loyal and supportive customer is going to have, relatively, greater impact. Anyway, I am taking the time to respond only because I, as have you, have seen dozens of these protests come down the pike over the years, and as well intended as they are, they have little success. I see now that my response was very pragmatic, though I stick by it. Crossing my desktop this morning, however, was a much more theologically perceptive and reflective response by Russell Moore. His post digs deeper into the reasons why boycotts are not a fit vehicle for the Christian message. We won’t win this argument by bringing corporations to the ground in surrender. We’ll engage this argument, first of all, by prompting our friends and neighbors to wonder why we don’t divorce each other, and why we don’t split up when a spouse loses his job or loses her health. We’ll engage this argument when we have a more exalted, and more mysterious, view of sexuality than those who see human persons as animals or machines. And, most of all, we’ll engage this argument when we proclaim the meaning behind marriage: the covenant union of Christ and his church. I encourage your reading the whole. The are occasions to make stands and to suffer the consequences. But an economic boycott aimed at strong-arming a position is not one of them. I had never heard of Nancy Guthrie until this lecture floated across my radar screen. Apparently she is a well traveled speaker (speaking in September here). Her reflections on what a church and her people should do to be a support for those who have suffered loss is greatly helpful. Is Your Church a Safe Place for Sad People?